Today* we move out of our house in Virginia, and I say goodbye (for now) to James Madison University. I'll be on leave for at least the next year while I am the Mathematician-in-Residence at MoMath, the National Museum of Mathematics. As a goodbye (for now) present to JMU, today I'm publicly posting the design for the infamous "JMU cube" business card holder that we've printed so many times in the JMU 3-SPACE classroom and the JMU MakerLab in Math/Stat. 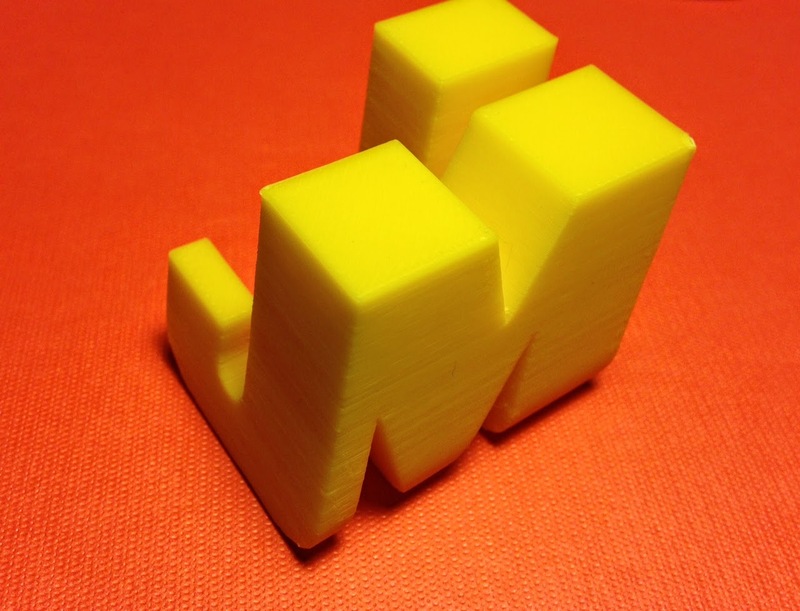 If you want to create other JMU-shaped objects then you can also download 3D-printable verions of the official JMU font-logo, or the individual letters J, M, and U in that font. Add them to your favorite 3D model to make a JMU-flavored remix! Settings: The cube and the letters print well with layer height .3mm/low on both the MakerBot Replicators and the Afinia H-Series Printers. Design notes, Illustrator/Tinkercad flavor: The logo and letters for this design were based on the official JMU letter mark. We loaded the official image into Adobe Illustrator and extracted outlines of the logo letters. We also made a backwards-leaning "J" to use in the cube model. The modified letters were then extruded in Tinkercad, and each letter was grouped in various ways with other letters as “holes” to make the final design. That makes it sound kind of easy, but this model went through four different revisions, with each revision taking 1-2 hours of design time. You can open the model in Tinkercad and repeatedly un-group the model to see how it was put together. The cube was originally going to mimic the Godel, Escher, Bach cover design, but the "J" and "U" matched up so nicely across from each other that we went with that instead. * Footnote: "Today" of course meaning June 30, which I am pretending it is right now while I am writing this post from the future. In the future future nobody will care that I am writing this past post from the past future. Present-people please bear with my procrastination-fueled time wrangling so that the blog will make sense to future-me.